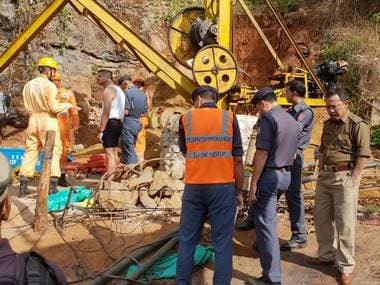 On 28 January, the Supreme Court had asked the Centre and the Meghalaya government to continue their multi-agency operations to rescue the miners. "The Supreme Court has been very clear that we cannot stop the operations to retrieve the bodies. We are going to appeal in the Supreme Court," Conrad told PTI. Multiple agencies are on the job to retrieve bodies of the miners trapped in the flooded mine, located at Ksan near Lytein river in East Jaintia Hills, since 13 December last year. During the operations, only two highly decomposed bodies of the 16 trapped miners were pulled out by the Navy's remotely operated vehicle on 16 January and 28 February. Conrad had earlier informed the Assembly that Rs 2.5 crore had been spent on the operation which began on 13 December, the day 16 of the 22 miners, who went down the illegal mine were stuck when water gushed in from the Lytein river. Last week, 50 Army personnel arrived at Ksan area to help the district administration set up girder platforms to place submersible pumps for pumping out water. Dewatering exercise has been continuing from 10 to 15 abandoned coal mine shafts to help reduce the water level at the rat-hole coal mine.